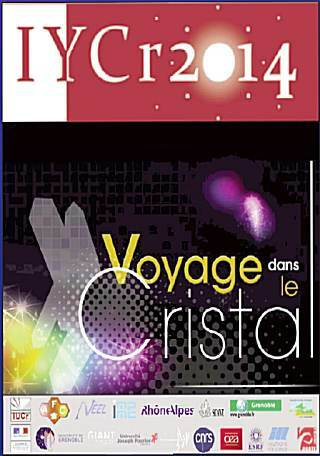 In 2014, a travelling exhibition entitled Voyage dans le Cristal (Journey into the Crystal) will take visitors on a journey of discovery of matter − but also on a journey through time to the beginnings of crystallography. Through this Journey into the Crystal, the public will discover why crystals intrigue people so much, why theyare so useful to science and why they play such an important role in our daily lives. 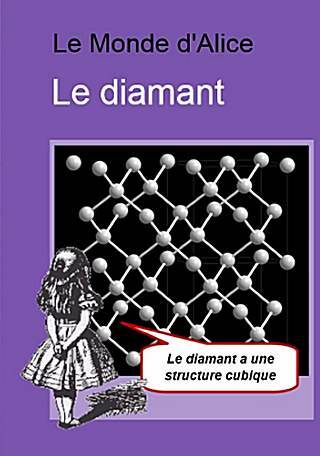 The numerous applications of crystallography not only affect our lives but also help us to understand the world in which we live. Here are just some examples of applications which owe their existence to crystallography: your car headlights, your Ipad, your medication, our knowledge of the centre of the Earth…. First to host the exhibition was UNESCO in Paris, as a side event of the Opening Ceremony for the International Year of Crystallography. The complete exhibition (36 panels) exists in English and French, soon it will exist in Spanish, Arabic and some other languages. A short version of this exhibition (12 panels) exists in Arabic, English, Flemish, French, Russian, Slovakian and several other languages. Now, they are taking to the road. 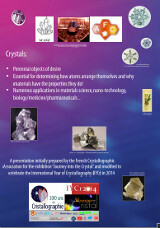 Jean-Louis Hodeau and René Guinebretiere, The experience of the Voyage dans le cristal travelling museum exhibition, Journal of Applied Crystallography, vol. 48, part 4.